Are you kidding me? Of course I want it!! 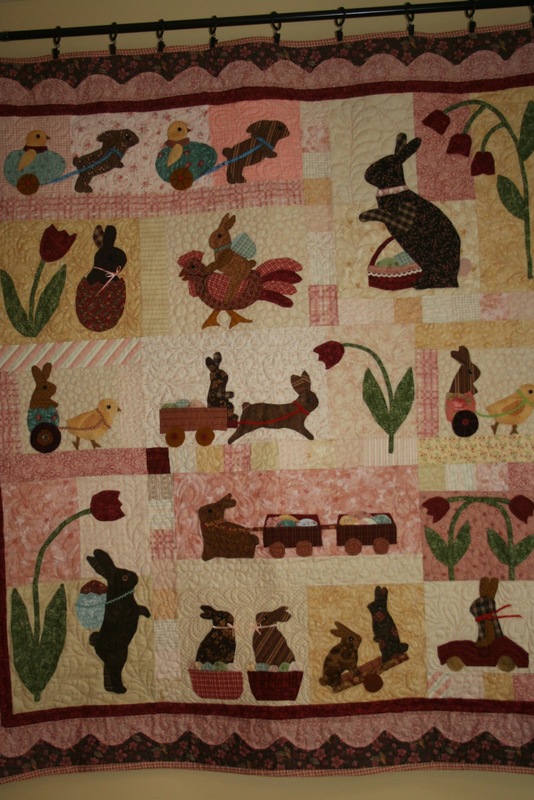 The pattern is called, "Rabbits Prefer Chocolate" by Anne Sutton of Bunny Hill Designs. My Mom did a great job of piecing and applique. The quilter really went to town on this one. Such a treasure! I had it up on the wall in about thirty seconds. Didn't want to give her a chance to change her mind (insert smiley face). The skies are so grey and dreary today. It's hard to believe at times that spring is coming. I'll have these little bunnies to remind me of the real ones I will be seeing soon. Blessings! Your mom did a beautiful job! Do you want it??? Wow of course you do. It's gorgeous! That quilt is just gorgeous and wasn't that nice of your mother to give it to you?! Would your sweet mama need another daughter? :) It is beautiful Renee! She does such a good job! I can not wait to see it in person. Oh my gosh! How beautiful! And how generous of your sweet Mom! So pretty - mom is talented! I love it!! 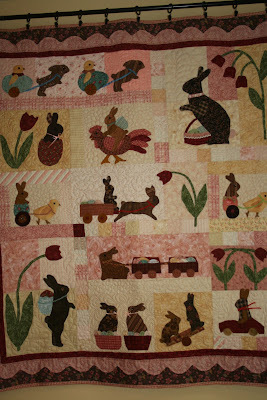 I have seen it on the Bunny Hill site, but I am still quilting my A Tisket A Tasket from there. Your Mom is so talented and you are blessed that she is so generous. It's perfect for Spring. Spring? What's that. Even here in Ca. we are still "dreary"
Wow - that is beautiful! Your Mum is very talented. This pattern is one of my UFOs. Thanks for the gentle reminder to get it back out! It is so pretty. Your mother is very gifted. What a dear mother you have! All the work and love that must have gone into this, it is absolutely stunning Renee:>) Lucky girl! Hi Renee - what a beautiful piece and what a fabulous stitcher your mum is. Blessings! 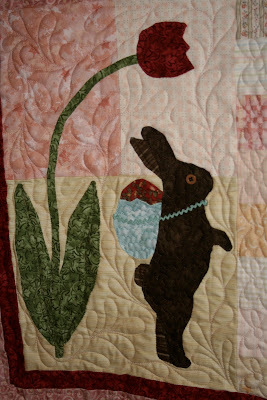 Very cute...the quilting looks lovely. Just beautiful and it must makes you smile! Wow! What a wonderful gift. I can see where you get some of your artistic talents. What a gift to have such a generous Mom. Been reading some posts I have missed. Always beautiful photos. Your mom did such a beautiful job on this quilt. And how nice of her to give it you.